SharePoint provides a vital service to businesses--content sharing over Intranet and Internet sites. Microsoft is investing tons of research and development money into content sharing technologies: SharePoint is the "next big thing" for MS Office users, especially in a world where many work teams are becoming geographically dispersed. SharePoint 2007 is a big improvement over former releases, due to enhanced security, better search capabilities, and more robust functionality. Lots of change means that users will have to come up to speed on the new enhancements. With Microsoft SharePoint 2007 Technologies, readers will gain a working knowledge of the architecture, administration, and end user features offered by SharePoint 2007. This book also provides practical techniques to help IT professionals integrate Sharepoint with other MS products such as Exchange Server. 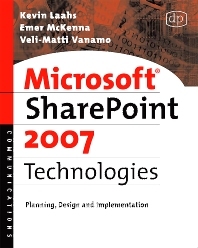 The expertise of the authors, who have helped many businesses leverage Microsoft technologies, makes this book an invaluable tool to anyone interested in deploying Sharepoint '07. More than 50,000 HP employees already use SharePoint, and that's just one company! “SharePoint 2007 will be an integral component of just about everything Microsoft does moving forward from servers and clients to e-mail and document management systems.” --Michael D. Osterman, President, Osterman Research, Inc.